One of the oldest and most popular pieces of training equipment is the medicine ball. It is also one of the most misunderstood and underused training devices. Michael Rutherford, a professional personal trainer and developer of Boot Camp Fitness, a sophisticated training and conditioning program, takes you to the limit with his medicine ball training exercises and routines. 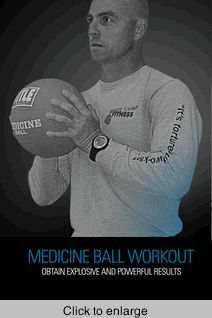 The medicine ball is ideal for helping obtain explosive and powerful physical results. Rutherford runs you through a wide range of plyometric exercises that will build the arms, legs, trunk and torso for any sport or overall workout program. If you are looking to add dominant power, overriding strength and sheer explosiveness to your arsenal, this is your ticket. Discover what the medicine ball can do for you and your game. If you want to perform like a champion, you must train like a champion.